This classic game was originally written in BASIC by the late Gregory Yob sometime in the very early 1970s. 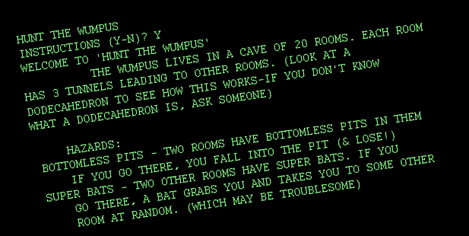 It circulated through universities and research facilities, and I first encountered it as a kid in the classic 1979 tome "MORE BASIC Computer Games." Rod McFarland's modern web-enabled version lets everyone try their hand at the hottest hide-and-seek computer game of 1972. Give it a try, but don't underestimate the danger lurking beneath that ominous green phosphor text. 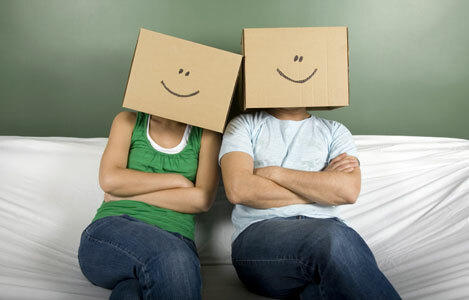 My wife and I are in the midst of packing to move to a new house. The only problem is that the new place won't be ready for another month, so everything is going into temporary storage during our "homeless phase." There are about a dozen copies of my Essential Retro book sitting on my desk. I'd rather not store them, so this is your chance to get a massively discounted copy: Visit the Essential Retro order page and you can get one with free shipping and an additional "moving mania" 20% discount (to get the discount, enter retrothing in the Coupon Code box). Jesse England prints Super 8 movies with an ink jet printer and transparency sheets. The process imparts an otherworldly look to even the most mundane footage, although each strip must be hand cut (including each teeny-tiny film sprocket hole) and spliced together for projection. He explains the process: "The first step was to obtain the correct dimensions of Super 8 film, make a template, and arrange video frames onto the Super 8 template. To avoid the laborious task of cutting and pasting hundreds of frames of video, it was converted into the "filmstrip" format using Adobe Premier. 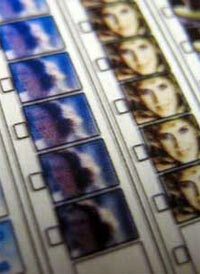 In Photoshop, the aptly-named filmstrip was cut and pasted onto the template. Once properly arranged, this template was printed out onto transparency film. The sprocket holes were cut out with a box cutter, and the 8mm wide strips of film were cut out with scissors. Finally, they are spliced together in the bias fashion with adhesive tape." I thought you might enjoy this amusing collection of postcards printed around 1900 by German chocolate and cocoa manufacturer Hildebrand. They depict a fanciful vision of the world in the year 2000. People are awful at predicting the future. This is especially true when imagining future technologies. The problem is that we are blissfully unaware of future paradigm shifts and radical innovations (not to mention cultural changes). Oddly enough, these shifts aren't as frequent as you might suspect. Looking back to the year 1900, the world was entering an age of incandescent light bulbs and considering the possibilities of the internal combustion engine. 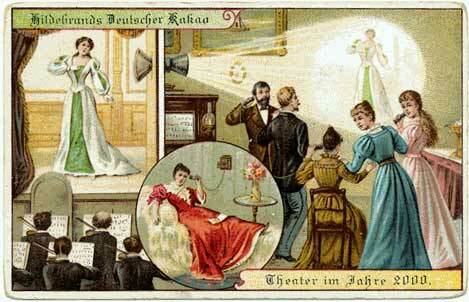 The benefits of X-Rays had been discovered, and motion pictures were an amusing curiosity. However, modern assembly line manufacturing was unheard of, airplanes were still a few years off, and electronic miniaturization and most of today's clever gadgetry made possible by the transistor was still a half century away. 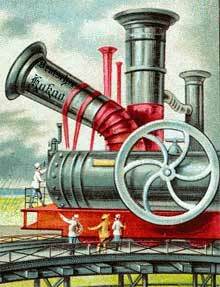 Fast forward just over a century, and the incandescent light bulb still dominates most of the world, along with its old friend the internal combustion engine (cough, cough). Motion picture film still captures arguably the best moving images and chances are you'll receive an x-ray when you break a bone or visit the dentist. It makes you wonder which vintage technologies will be lingering a century from now. I just hope someone figures out teleportation before my next holiday. 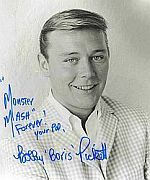 Bobby "Boris" Pickett passed away April 25th, 2007. Pickett's claim to fame dates back decades ago. While performing in a band, Pickett ad-libbed a Boris Karloff voice in the middle of a tune. Encouraged by friends to create a song around the impression, in 1959 he created a jaunty little novelty number called "The Monster Mash". The song tells the story of a scientist who creates a monster who then spawns the dance craze. Monster movie type sound effects, a few jokes, and impressions of both Karloff and Bela Lugosi made the song a perennial Hallowe'en favorite worldwide (it hit #3 in the UK in 1973 after a 1962 ban for being "too morbid") from then on. The song has been covered countless times, a classic many times over. 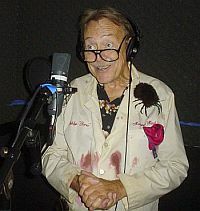 Pickett continued to perform the song throughout his life, and in 2005 recorded a new environmentally themed version called "The Climate Mash". In the 70's I remember visiting a friend of my parents. He was quite a bit younger than they were, and he had a real bachelor pad going. He had one of these plastic twisty sculpture things, but it was chrome. It consists of a number of curved sections of tubular plastic, and you can twist it into a number of abstract shapes. It's not a puzzle, nor is it flexible, so every variation kind of looks like a thick rope of ketchup on your table. I guess that it might be sort of interesting in a moebius strip sort of way, but I can't say that it strikes any resonance with me. It is cool to have a piece of affordable art in your home (I wonder what kind of store carried this? Is it from a specific designer?) that you can be sort of interactive with, but I feel like I want more out of it. I shouldn't complain about it too much - my parents' friend was quite a ladies man so maybe this sculpture was a crucial part to his 70's bachelor cruising. Do any of you have any more details, dear readers? May 19th marks the tenth anniversary of The Moonwalk, a nighttime breast cancer walk sponsored by Playtex in the UK. The event encourages women to wear decorated brassieres, setting up tables with arts and crafts supplies to festoon the undergarments before the walk. To commemorate the 10th anniversary, Playtex has created this glow-in-the-dark bra set - though it doesn't seem to be available to the public. Several of these outfits (is a bra really an outfit?) will be worn by celebrities, but Playtex will be making bra glow kits available that evening so that everyone can light up the night. The homebrew designed bras range from pretty and arty to bawdy and humorous, but whatever the attitude may be, the event really does work. Last year Playtex helped raise 4.6 million pounds, and they hope to top that figure this year. We've come a long way from ladies underthings being secret and cruelly constrictive, to a "let's all grow up and have a little fun here" kind of thing. I can only imagine some of the great decorations that will march by with all the glow-in-the-dark upgrades adding a sort of marquee effect. I'm sure that it'll get a lot of press, and hopefully focus even more attention on a great cause. By the way, notice how I've neatly sidestepped all the obvious jokes, like say making an Irish gag with "Erin Glow Bra", or some other dopey stab at humor. Bra-vo for me. Perhaps it was evidence of how paltry my local library was, or maybe I was as weird a kid as I am an adult, but I remember reading a lot of really old books full of "dangerous" projects. I pulled out lots of project books that had their first printings in the 30's, often listing ingredients you couldn't get anymore. I realize now that perhaps I shouldn't have burned all those holes in the lawn, nor used the toilet & plunger as pestle & mortar. I did actually learn stuff from those old tomes though. Those old books had no reservation in teaching amateur chemistry, model rocketry, building things out of scrap lumber, using a knife... knowledge that some parents groups seem to want kept secret nowadays. Not only is there a conscious effort by some adults to bubble wrap life for their children, but many kids are so embroiled in virtual games and digital experiences that they're not aware of the real magic and adventure that lies in their backyards. This book collects some of the best of these old projects. 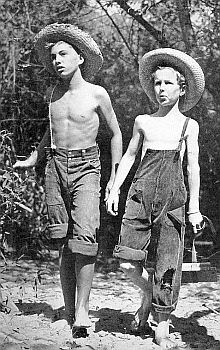 What boy wouldn't like to learn how to make their own timer and tripwire? A periscope or go-kart? You'll learn about the greatest paper airplane ever, how to palm a coin, and the five knots every boy should know! This is the kind of stuff that my father showed me how to do - the kinds of things I thought everybody knew. 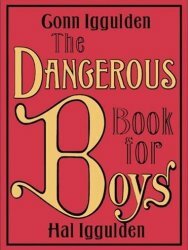 "The Dangerous Book For Boys" is a great title, but it could potentially scare off a lot of parents. The world isn't made of Nerf, but neither are there monsters around every corner. This book hit #1 in the UK, and hopefully it can do the same here. Let's see some enthusiasm around the good ol' non-volatile read-only media we call "book". Lionel is famous for having popularized model trains. While they sometimes took liberties with detail and scale, this let them bring a lot of fun toylike accessories to your train layout. Lionel's fame still lies in their large O scale fleet, but they also produced trains in the popular HO scale from 1957 to 67. Most of Lionel's most famous rolling stock did things. There is the famous aquarium car, a livestock loader that uses loud vibrations to rattle the cattle into place, as well as military cars with spotlights and launching missiles. They brought some of these "Operating Cars" to HO when they tried to break into that growing market. 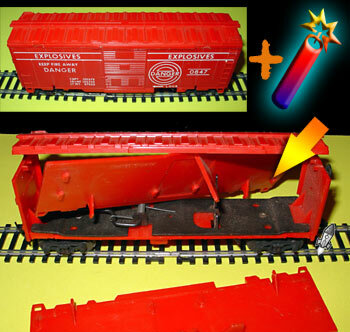 The mechanism in use on the HO exploding box car above is rather clever. It's a spring mousetrap affair that you set before carefully assembling the sides and roof. The car stays together as it's trundling down the pike thanks to a catch, but unlock that and a protrusion on the bottom becomes the freight car's glass jaw. Hit the right stretch of track and SNAP! The boxcar (marked for carrying explosives, hah hah...) flies to pieces. Maybe it's not cool to play at blowing stuff up these days, but this is still a pretty nifty toy. Even after 50 years the spring is still very snappy and sends the car to kingdom come. Maybe I should repaint it to look like the boxcar is carrying cheese, so that maybe I can catch a mouse inside. It's been a while since I've posted on Retro Thing. I've been working on a number of projects behind the scenes here at RT Chicago, but I'd rather have been relaxing in a hammock with some cool exotic drink and crowned with a fez. When we see a fez today, we automatically think of leopard print smoking jackets and the pipe and snifter crowd. Yet the history of the fez is a lot less fun. It's been everything from a military headpiece to an important Islamic symbol. Religious comic book artist Jack Chick even maintains that the fez was originally dyed red from the blood of murdered Christians. Eww. So how did the fez become so closely identified with the 50's leisure class? It may perhaps come from the late 19th century English custom of relaxing in the evening in a smoking jacket and a knit cap resembling a fez. You can still see fezzes in use around the world, but today the most common place an American might see a fez is atop a frolicking Shriner. Shriners are a fraternal organization tied to the Masons, most famous for their fezzes and children's hospitals (and their motorized cars that look like flying carpets, but that's another post). The Shriners formed in the 1870's, taking on an abstracted Arabic look including the traditional headgear. Shriners have always known know how to toss back their tassel and have fun at their frequent meetings, so it's no wonder that the fez would come to symbolize fun and relaxation even to those of us who are not members of quasi-secret organizations. 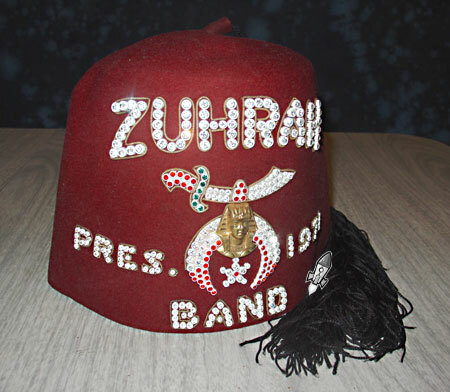 This particular fez is blinged out with precious gems spelling out "Zuhrah" (whatever that means), atop a sabre/sphinx logo, and declares the wearer the 1971 president of the band. I found the wearer's name in the hatband ("fezband"?) and his Minneapolis Shriner's group. I shouldn't be surprised that this fez ended up here in Chicago given the long strange trip that the fez has made through history. 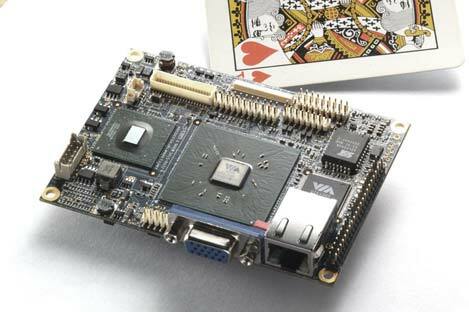 Pico-Sized Embedded PC: Case Modders and Device Benders Rejoice! Crikey, this thing is small. What you're gazing at is, of course, the king of hearts tucked underneath Via's new Pico-ITX form factor PC motherboard. This fully-functional machine measures a mere 10 x 7.2cm (3.94 x 2.84 inches). The 'secret sauce' that makes it all possible is the VIA VX700 System Media Processor, which integrates a C7 processor with Unichrome video, HD audio, up to 4GB DDR2 memory and SATA II and IDE drive support. 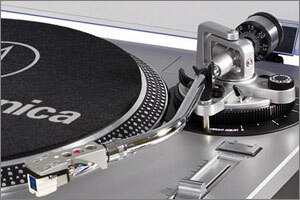 It also offers six USB 2.0 ports and hardware MPEG-2/4/WMV9 acceleration. In other words, this is a device bender's dream come true. It's now possible to build a fully-functional PC into a vintage coffee can, classic toaster, tiny portable TV or even a re-purposed tabletop tube radio. And -- if you haven't already guessed -- I'm tingling with excitement to see what sort of magic people manage to pull off with this board and dead vintage tech. You've come to the right post if you're the sort who rides motorcycles because cars are slower than turtles. This is the Ariel Atom, no relation to the European laundry soap of the same name. Ariel is Britain's smallest automaker, employing only seven speed-crazed souls. They market their cars with the slogan "No Doors. No Screen. No Roof." For most car makers this would be the kiss of death: "Hullo, Mrs. Jenkins. Your new Toyota Flowerpot arrived at the dealership today. No, no... we don't offer boring old doors or a windscreen anymore." Thankfully, the Atom has an amazing trick up it's sleeve: zero to 100mph (161 kph) in a blinding 6.8 seconds. Or -- if you can shift fast enough -- zero to 60mph in a tad under three. The Atom costs about 35,000 euros and thoughtfully includes a passenger seat for a suitably insane friend. The 'Net has recently been abuzz with some awe-inspiring watch designs. Let's start our roundup by taking a belt-driven model for a spin. The TAG Heuer 'Monaco V4 Concept Watch' [via Gizmodo] was produced in a limited run of only 20 units. It uses a series of thirteen tiny drive belts measuring a mere 0.5x 0.45 mm and relies on the "world's first" linear-oscillating mass: a 4.25-gram platinum ingot. 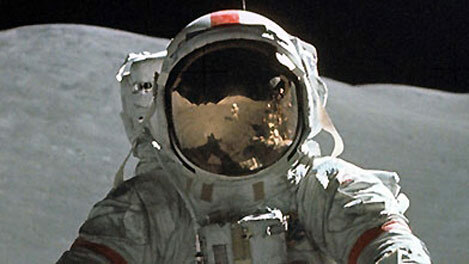 British director David Singleton recently completed a new documentary that revisits the personalities behind the Apollo moon landings. In the Shadow of The Moon weaves commentary from all but one of the nine surviving astronauts to set foot on the moon (the holdout was Neil Armstrong, who is notoriously unwilling to grant interviews that rehash his "one small step."). "One of the most important legacies of Apollo was recognizing just what the planet Earth is. One of the interesting things to me is these guys know that viscerally, not just intellectually. They’ve been there; they’ve seen it with their own eyes. There’s a certain urgency and impatience when you talk to them, that somehow we are not really picking up on that message. [John F.] Kennedy was very important that way, at galvanizing the nation. I hope the film is a reminder that with a political will, and by pulling together, it is possible to solve problems that seem more difficult, but really are not more difficult, than going to the moon. To us, the film is an elegy and a rebuke and an invitation." The film recently won the The World Cinema Audience Award at the Sundance Film Festival. It struck me this afternoon: Star Wars now qualifies as Retro sci-fi. Oddly enough, this came as a complete surprise because the film was - for better or worse - one of the defining moments of my childhood: I couldn't believe the stunning special effects or the otherworldy sets and creatures. I was awed by the medieval romance of lightsabers and tempted by both sides of the force. I was overwhelmed by the sheer number of Star Wars action figures. The film made the cheesy special effects in Doctor Who harder to watch than ever. Heck, I wasn't even old enough to realize that the dialog was exquisitely hokey (especially Luke's wamprat-like whining). All of this is a rather roundabout attempt to justify this post. 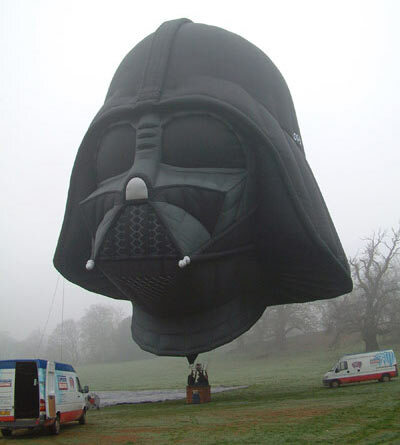 It's a hot air balloon shaped like Darth Vader's helmet, designed by a team headed by Belgian Star Wars fan Benoît Lambert. It was inflated for the first time on March 8, 2007 -- although a few tweaks were required to make it look just right. It measures 26 m (86 ft) high, weighs around 260 kg (640 lb) and accommodates two passengers and a pilot. Let's hope he doesn't follow up with a gigantic Jabba the Hutt dirigible.